Prince Arslan aka Su-Wun/Yona life changes when their kingdom gets overthrown. Now they must find people to help relaim their kingdom and learn about the world. Hak/Daryum protects him/her and watches Arslan/Yona grow from this journey. -Both contains stories of ancient powerful kingdoms being overthrown and their rulers- usually a king being murdered by a traitor. - The MC character was portrait as weak, fragile and feeble. - Each one though one were female and the other male, changed over the course of the journey they had to undertake. - They both grew into some more. Something that wasnt expected of them. - A story of adventure, betrayal, defeat and power. Story of underdog crown prince/princess.You can summarize both series like that.Only real difference is gender of mc and this cause a focus change.In AS focus is military/diplomacy.ANY focuses recruiting "aid" for her cause and claim.But don't get me wrong.Both mc has a strong point and they are not totally useless leaders carried bt other. Both anime feature a prince/princess who is trying to recover their country. They go on a journey and meet lots of people that are willing to help them to achieve this goal. They are recognized by their great and different leadership. They learn more about the world after leaving their cities/castles. Royalty placed in a position unknown to them. Forced to survive and find companions to create a new life. These shows mirror each other in a lot of ways. However their differences make them both worth your time. Arslan Senki may lack some of the same fantasy or romantic elements, but makes up for it with strategy and action. Both have a king overthrown and subsequently the heir is thrown out and is targeted by the the enemy. Both the overthrowers claim to be the rightful heir to the throne. The prince/princess is first protected by a strong general and then goes on to gain more support to make a comeback. The plot is pretty much the same. The time in which the story is set is probably similar. There are more supernatural elements and romance in Akatsuki no Yona but both shows fall in the same genres: action, adventure and fantasy. Yona is just a shojou version of Arslan Senki. A young prince/princess travels around collecting hot men to protect them. High quality animation and interesting cast of characters. Similarity: Sheltered youth who are driven from their homes. They begin their journey to recruit new allies and battle enemies for the power struggle. Settings are consistent with feudal Japan. Personal Preference: Akatsuki no Yona has better storytelling. Child prince(ss) is exiled from kingdom and travels in the outskirts of civilization with weapons-master, while collecting a party of more friends in an attempt to go back home and solve whatever problem drove them out of their kingdom in the first place. - At the start of the series the main protagonist is a weak fighter who gets stronger through the series. - Both of Yuna/Arslan have their loyal group of fighters who are ready to sacrifice their life protecting her/him. Two royal blood protagonists who by misfortune of life or fate, end up losing everything and comes in looking for a new path. Showing their will power and the growth of the characters. Dois protagonistas de sangue real que por infortúnio da vida ou destino, acabam perdendo tudo e se vem em busca de um novo caminho. Mostrando a força de vontade deles e o crescimento dos personagens. protagonistes are both soft hearted without the slightest idea about the outside world...and one day they loose their kingdom and they are about to learn to live in a different away about the away they lived until now.. Both stories are set in the historical times and is about trying to get back their kingdom. They both include war and betrayal. In Akatsuki no Yona, the leading character is a princess with her bodyguard/knight trying to find the other 'dragons' and getting back her rightful place. Similarly, in Arslan Senki, Arslan is the leading character who is a prince also tries to get back his kingdom with his knight and others. The storyline for both anime are very interesting as we see both leading characters become stronger throughout their adventures in accomplishing their goal. Both series involve royalty that are overthrown from their throne. They are determined to take back their rightful place by traveling towards their goal and gaining comrades along the way. Both tell the story of young princes who end up losing someone important in a palace / kingdom attack and because of this they travel with a small group of prince / princess colleagues. During their travels they meet new people, and learn more about their own realm. Both anime's have the main character driven from their homes as royalty and follow their stories and adventures of gaining companions to one day return to their home and retake it. The obvious difference being the main character being of different genders and Akatsuki no Yona having a sort of reverse harem theme. Both animes have excellent fighter main protagonists who fight for a cause or person. Both animes contain a good amount of action and drama so if you liked Arslan Senki I would strongly recommend this anime for your next watching. They've both got an almost 'Game of Thrones' sort of feel. Also, Arslan Senki is made by the same author as Full Metal Alchemist. -Both have young ignorant weak prince(Arslan)/princess(Yona) who gradually develop and become stronger only because they are kicked out from the palace. -Both have a historical setting. (Arslan Senki is in Persia/Iran and Akatsuki no Yona is in Ancient Korea) -Arslan Senki focuses on Arslan becoming king, while Akatsuki no Yona focuses on Yona helping poor people in her kingdom. Both are great animes to watch if you're a fan of historical animes. Both shows revolve around a MC who is thrown out of their kingdom and must fight to get it back. Both main characters are an heir to the throne of a powerful kingdom that is taken away from them. The main characters both embark on a journey with a very strong character with a spear/staff weapon. On their journey both main characters gather a group of powerful warriors to help them take back their throne. They are both about a person from a royal family leave the castle with a close friend. Make friends along the way. Has one friend that thinks they are useless. But over time like them. Both have 6 people in their group counting them self. Has a cousin that takes over the castle. While doing something to their father either killing or torturing. Both take place in the past. The main characters are both next in like for the throne until a coup happens by an evil cousin, which forces them to flee from their home while being protected by the strongest warrior in the army. Both characters are weak combat-wise and rely on others to do all the dirty job, they go a journey to find strong warriors to help them reclaim the Kingdom. A prince who lost his kingdom and the go on a trip to get it back with the help pf travellers with unique skills that decide to follow him because they consider him "good enough" to be a king. Both series are set in a historical world, although the settings are different. Both protagonists are a royal prince(ss) and try to deal with the betrayals and politics in their world. They have also a kinda similar personality, imo. They are kind-hearted, grow a lot and nonetheless they are also able to fight. SPOILER ALERT it has a very similar vibe. Both shows have there kingdom taken away and are forced to work from the shadows in order to take back there kingdoms. They both also have funny and light hearted moments. Every leader needs an Op strategist and neither Arslan nor Kingdom is different in this matter.In both anime an old kingdom fight with other kingdoms mc starts as lowest and try to rise in his career.Since Arslan is crown prince anime focuses about diplomacy , relationship of other kingdoms , alliances and religion fight kingdom focuses fights ranks and tactical battefield. Both anime's are about a great war with kings and big army's. If you liked Arslan Senki, "Kingdom" is a great recommendation. 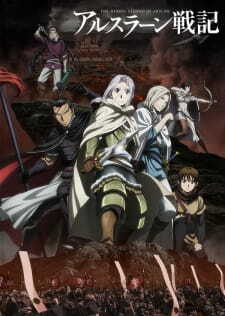 This anime is amazing, a great story that it has for the moment two seasons with 38 and 39 respectively, for my opinion is better that Arslan Senki. This anime is about Shin and Hyou, they are two war-orphans in the kingdom of Qin. They dream of one day proving themselves on the battlefield and become the best general. Suresly you will like this anime. - Epic war stories where a young man of royal blood must fight to reclaijm his kingdom with the help pg his loyal and powerful companions. - Both have Awesome War scenes and Fights. The setting and atmosphere, as well as character design give off very similiar feeling. Both concentrating on the comng-of-age journey of young boys in positions of power/military, as well as medieval wars in the south and east. Similar Middle Eastern setting. Both have the main character in late teens with heavy responsibilities. Both are about a young intelligent MC who travels around his and other country's in order to help their country. Through their travels they learn about the different kind of culture and politics each city has. Its an adnventure set in older times with the same feel although to be honest Arslan Senki was a better anime, but i enjoyed both. They are both taking place in a historical setting and are about young royal boys in a position of power. Although Mahmut isn't a prince, he holds a higher political place. Both of them are kinda similar personality-wise and have a very useful bird of prey as an animal-sidekick. The stories are also similar. While they aren't similar in plot, the shows are similar in aesthetic feel and theme. Both shows take place in ancient time in foreign countries and center on war. In Altair, the protagonist isn't a prince, but a Pasha (sort of like a military general) and he (like Arslan) is a pacifist and wants to prevent as much death and war as possible. So when fighting comes about, the protag for Altair (Mahmut) comes up with creative ways to avoid war and death. Both contain battles with large armies and have war as a major theme. Adventure animes that feature the military, as well as military tactics. In Madan Ou no Vandis it incorporates a harem but Arslan Senki doesn't have one. The setting is also both set in a feudal and middle age environment. Both shows are about strategies, wars and rivalries. Both anime have great battles. Watching them reminded greatly of each other. Child princes are exiled from kingdom and travels in the outskirts of civilization with weapons-master, while collecting a party of more friends in an attempt to go back home and solve whatever problem drove them out of their kingdom in the first place. both are about young princes that need to be protected while trying to accomplish a certain goal. great storytelling on both with decent action to get by. I believe these shows to be very similar. In Arslan, the young prince holds a bit more control than in Seirei, however they are both very kind, smart, and understanding children you find yourself rooting for the entire time. Seirei is a bit more serious with less of a comedic tone, but has a lot of action. If you liked one you should like the other! Both shows are about a prince who has to leave his castle for a while. Both shows could be historical fiction, but have a signal element the makes them fantasy. Both anime follow a prince and are historical. If you enjoyed some of the conflicts that Zen had to deal with in Akagami no Shirayuki-hime then you would enjoy Arslan Senki. Also the art style is similar. These two animes are nothing alike but Zen IS Arslan in 4 years. They look and act exactly the same, and they're both princes with an unfortunate family situation. Past that, the shows are completely different. One is a slice of life shoujo romance and the other is full of action, large scale battles, political scheming, and violence. Arslan Senki is basically Akagami no Shirayuki-hime but you take out Shirayuki and the romance. Both animes main protagonist experiences events that strengthen their resolve for their royalty and both Zen and Arslan have loyal companions that they adventure with. The only difference being that Arslan Senki looks at the war side of that time and Shirayuki-hime focuses on the political and romance side with much less actions scenes and more relaxing setting. The animes have an adventurous feel, and is centered around a very likable group of people. They incorporate government, and military strategies. But in contrast Magi has a comedic feel, and Arslan Senki is more dramatic. Both have a prince/princess thrown out of his/her kingdom for a reason and they are protected by their close ones first and then gain some supporters. Both animes feature medieval settings. Both animes center a character of royal origin traveling their kingdoms with a band of allies who protect them from their pursuers/people who want them dead. Both animes are around the same number of episodes. If you liked one anime, chances are you'll probably like the other too, since they both give a similar feel which may be partly due to the setting. And the protagonists from both animes undergo some sort of character development, seen more prominently in Arslan Senki than in Scrapped Princess. It is only in the beginning of Alderamin on the Sky, but I feel both series have lots in common. Primarily war and intelligent strategists. I am not sure if the development of Alderamin on the Sky is going to follow the same direction as Arslan Senki.. Adventure shows, with an interesting fantasy twist. The character designs are very similar, and have a more serious tone in both, though FMA:B has a slight comedic feel. Animes about political and military struggles with lots of intrigues and with the same fantasy atmosphere. They both revolve around the theme of heirs reclaiming their country. In terms of appearance, Remus and Arslan are also very similar. The only difference is that Guin Saga features twin heirs and is slightly more fantasy themed. An overwhelming wave of violence, blood, gore and unbelieveble rage will fill you up so that you'll choke on it. Legendary anime that shows true side of life with no decorations just in another fantasy world. Arslan Senki and One Piece are both incredible stories of a boy who sets out on an amazing adventure in order to become king and gain freedom. Both main protagonists are able to gain many followers as well as strong and loyal nakama to accompany them due there unique personalities. Both anime have a great contrast of humor as well as great seriousness that go well together. To anyone who likes One Piece you will definitely enjoy Arslan Senki the two anime are incredibly different but if 1 appeals to you the other is sure to do the same. Both involve a boy on a mission, and all the friends that he meets along the way. The main characters both have kind hearts, and serve as unexpected leaders. Both anime are engaged in war. Both main characters have to fulfill their destiny. Arslan and Ryner Lute have loyal and caring companions to oversee them. Both need to have a justifiable ending that such story should deserve. These series do feel very different but, if you enjoy one you very well may enjoy the other. Despite their obvious differences, they do share a number of commonalities. Both featured swordplay mixed with a bit of the supernatural as well as conflict arising from the succession to the throne. Furthermore, the right hand man/woman of the main character is portrayed as an exceptionally skilled warrior and emotionally daft individual. While the animation of DenYuDen is certainly more dated, it is still worth watching. Both are fantasy shows written by Hiromu Arakawa. The character artwork looks very similar and both shows involve a main character who is out to change the world after witnessing the brutalities that other kingdoms have suffered through wars and other conflicts. - Both have the same mangaka (very similar character designs). - Both have religious settings. - Both have to do with some sort of war. - Both have a strong main cast with individual characteristics. If you appreciated the storytelling of Nuraihyon, a coming of age story where a young man trains and is groomed as a leader, then that is a notable similarity. Additionally, the use of sexuality is not thrown in their for some cheap entertainment. It's also worth noting that Arslan is a series that takes itself a tad more serious. Based on novels of the same author, the works may be of different genres, meant for different ages, but both focus strongly on planning, strategy and battles, along with governance and politics. Legend of the Galactic Heroes focuses on the questions of autocracy versus democracy, while Arslan Senki tries to examine the qualities of a good king. The two have a lord or king premise. Where they are "royalty" or leaders. They have good storyline and plot. Both main characters fight with their soldiers. Good balance of action and calm times. Fun to watch as the two kings/princes develop and climb to the top. Making a name for themselves. Both are medieval, but Chain Chronicle: Haecceitas no Hikari have fantasy elements. Arslan is more realistic, have a history baseated in Persian Empire and a hero called Amir Arsalan. Master/servant dynamics as well as supernatural themes, with a dash of (arguable) BL subtext. Similar themes of adventurous journeys, action, rage-against-the-machine, and (arguable) BL subtext. Both animes have as base a historical theme with very nice characters and good fights with swords. Also both animes have a good direction and use of the 3D technology for the action scene, making this very epic in several moments, and for the sword swings. both involve characters originally naive and timid who grow mature and wise through the struggle of war. for them to become rulers seems a little far fetched. but with that innocence comes a kindness that their lands are unaccustomed to and that gains them loyal followers who fight with them to make their worlds a gentler place. "Rage of Bahamut: Genesis" / "Shingeki no Bahamut: Genesis" and "The Heroic Legend of Arslan" / "Arslan Senki" are pseudo-medieval fantasy series that feature large-scale battles involving countless individuals. In both of these shows, there exists the depiction of a class system in which society respects. ►In both animes the protagonists are teen princes who flee their kingdoms and then fight to recover them. ►Jordy and Arslan (protagonists) are of kind character. In both anime series: The main characters (a prince/princess) were betrayed by their own people and the traitors either kill the king and/or take over the kingdom They go on a journey to get stronger and come back to fight and take back their kingdom They enlist the help of strong and powerful warriors The prince/princess have similar traits such as: they are kind hearted, soft and somewhat weaker than the other fighters. The prince/princess have a person that its their right hand and will protect them no matter what. Nezumi and Shion resemble Daryun and Prince Arslan. Their individual personalities, their companionship, and even the way they look, it all seems uncannily similar. The theme of oppression and social inequality is prominent and important for both stories. They both take place in cruel and/or dystopian worlds. Tragic circumstances bring the main characters together to fight for their lives and for a better future.. The setting for the two is very similar with the old middle eastern kind of feeling to it. There is no magic in Arslan Senki, but it does not change the fact that its plot is worthy of being compared to Magi. Farangis can talk to djinns like in magi. "Gankutsuou: The Count of Monte Cristo" and "The Heroic Legend of Arslan" / "Arslan Senki" both involve a young and naïve male protagonist of high birth who lives in his powerful father's shadows. In both these shows, military campaigns are given a relatively heavy focus as the background in order to set the premise. Big scale war. Lovable characters, some comedy on the side. Excellent animation in battles. Protagonist leads a small but victorious unit into battle. Both stories revolve around war and aren't afraid to show the uglier side of wars. "Akame ga Kill!" and "The Heroic Legend of Arslan" / "Arslan Senki" share the premise of a pseudo-medieval fantasy kingdom having underlying societal issues, in which there exists the oppression of foreigners and those of low birth. These two shows both have a focus in action as well as a male protagonist who is far too naïve. "Sands of Destruction" / "World Destruction: Sekai Bokumetsu no Rokunin" and "The Heroic Legend of Arslan" / "Arslan Senki" are pseudo-medieval fantasy series that focuses on a naïve male protagonist who is inexperienced with the real world. In both these shows, the system of slavery in place forces people who are seen as being of lower birth into harsh labour. Although is not set in a MMORPG world, Arslan senki is similar on the leadership aspect. They are both about suddenly becoming responsible of a loyal group of people and also learning and discovering more about the world they live in. There is magic, gore and good fights!